In a world of kitchen gadgets gone amok, there are some that look cool, and some that might make you look like a fool. When you live in a small kitchen, things get pretty brutal, and when natural selection kicks in, only the essential equipment survives the cut. Yes, my mixer and espresso machine get a disproportionate amount of space, but only because I use them a disproportionate amount of time. But down below, every year or so, I go through my gadget drawer and take out anything I haven’t used in a long time. My chocolate thermometer stays, along with all my measuring cups, the pair of cherry pitters (I invested in two, which ensures help), that super-handy little offset spatula, a pile of plastic scrapers, the essential Microplane zester, mini-spatulas I bought at Ross in Fort Lauderdale (which one might think are silly, but I use them all the time), the all-important wine opener, ice cream scoops in every conceivable capacity, and my Michael Graves vegetable brush from Target that I have to keep hidden away in a drawer because “someone” keeps trying to use it to scrub pots and pans and I don’t know when the next time I’m going get my derrière back into a Target again in case I need to replace it. But other things, like the metal shot glass, the crab forks, the angel food cake cutter that looks like a ‘fro pick, and the cookie cutter in the shape of an ice cream cone (with apologies to whoever gave it to me…but hey, I did use it once), are now stashed away in a box in the back of the cabinet underneath my sink, which I will probably only see again the next time I move. But one item that doesn’t even make it into the drawer, that I keep in a jar on my counter within reach at all times, is a sturdy pair of scissors. I use them more and more every day, and have started using them for many of the things that I used to use a knife for. 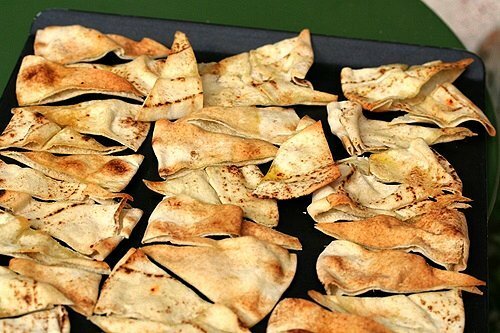 I trim leaves off radishes, cut kimchi for fried rice in a bowl (so it doesn’t stain a cutting board), neatly cut fish, re-size parchment paper, and portion pita triangles for toasting. And I’ve recently become a convert to using them to cut up a roasted birds, like the pair of guinea hens I wrapped in smoked bacon and roasted in cider last weekend. They make easy work of the task, and since you can do the work right in the roasting pan, you don’t lose all the tasty juices which tend to cascade off the cutting board and make a mess all over the counter. Get yourself a decent pair. Mine are made by KitchenAid (part of their Cooking for the Cure program) and if I could slice bread with them, I would. A good pair should cost between $12-$15. Being thrifty, I did once make the mistake of buying a cheap pair, which I picked up at Ikea, which are now in that box underneath my sink. Visit your local cookware shop and pick up the scissors—literally. They should feel solid and substantial in your hands, move easily, and not feel like work to open and close them. And you should get the sense that if you were clipping through the backbone of a chicken, that the bones would crack, rather than the scissors. Since I’ve started using scissors more and more, instead of a knife and cutting board, I’ve reduced the amount of dishes I have to wash, and the mess, which is something you can’t put a price on. So although I’ve gotten rid of a lot of useless gadgets, my scissors, I’m happy to say, have made the cut. Couldn’t agree more. I am a scissor girl through & through. Good to see I am in good company. Now if only I could convince my hubby to use them when he cooks! I discovered your blog looking for something about Marion Cunningham, and I love it! I lived in Paris on and off a number times many years ago (in very small spaces), and I too have a pair of scissors just like the ones in your picture. Following my mother’s example. I use them to cut up roast chickens, snip hot quesadillas into portions, trim flower stems, and any number of other tasks . There’s a little slot in my knife block where they fit perfectly so they are always at hand. The come apart so I can wash them more easily, and they are super solid and strong. Love them! Hey David, I love how you go from being a media superstar to a homebody with a junk drawer like the rest of us, (although your drawer looks pretty snazzy). I too can’t live w’out my Henckel- for snipping herbs, cutting canned whole tomatoes, slicing pizza. If I’ve got a pot of something going on and a chunk looks too big, scissors to the rescue! Scissors are da bomb for cutting up pizza. Oh yes, I use mine all the time – I have one pair of cheapie scissors for opening packages, cutting string, etc. Then I have my big ones that no one is allowed to use for anything but cutting food. I used to be married to the Wiss scissors rep in the area, so I got all kinds of high-quality sewing scissors, mending snips, etc., etc. — but the kitchen shears are my all-time favorites, especially for poultry — nothing else works half as quickly or as well, and there’s a disgusting satisfaction to the crunch when you’re cutting the backbone out. Money saving tip — buy whole chicken and cut it up yourself — then you don’t get all the extra chicken fat that they stuff underneath the parts when you buy pieces, and whole chicken is cheaper than parts, anyway — and then you have control over the pieces (some recipes you want leg quarters, others you need them separated) — and you have the neck and back to use for stock. I can’t live without my kitchen scissors. I have 2 pairs. One went missing for about a month and everybody in my house heard about it numerous times..they showed up mysteriously last week and no one knows how..but the most important thing is they’re back. I cut everything with them..even pizza! I can’t even remember life without my pair of scissors handy. They are on my counter, within reach, at all times. In fact, I have two: one for cutting open bags, the other for food. Oooh, thanks for validating me (not that I need it, of course)! One of my favorite and most-used tools is a pair of Fiskars shears that hangs on the magnet strip along with my best knives. They are actually intended to be garden shears, but wow do they work great in the kitchen! They are serrated for a good grip on slimy stuff like raw chicken and bacon, and even have a notch thingy that grabs small bones. Mincing herbs, cutting chives right over a pile of potatoes? Scissors. Let’s hear it for the scissors-enlightened! This is a timely post as I’ve been eyeing my overflowing kitchen gadget drawer for a couple of weeks now. I never considered using scissors to cut up pizza – what a great idea!! I love those little mini spatulas in your drawer. I’m off to get rid of a lot of useless junk now. I can’t live without my Henckle scissors either which are hanging on a hook on the wall for easy and frequent access (and they don’t hog up space in my utensils pot). Speaking of gadgets and limited kitchen space, I just bought a new knife block to accommodate my new Shun knives. I got a VMF “block” that is basically a lovely wooden box containing densely packed bamboo bristles that snugly hold the knives. It takes up half the space of the former knife block. I had never seen this clever idea before. Great advice on how to pick out the best scissors. Those shears are almost 20 years old now, still sharp, and on my top ten list of best kitchen tools. Carrie: They were originally these spatulas, but I couldn’t stand those silly egg-things on the end. And since the pair was only like $1.99, when I got home, I crushed them with a hammer and the egg-things fell right off. Such a deal! Gwen: (Aside from those spatulas)…cheap cookware is rarely a good deal. There’s nothing worse than trying to cut something with a crummy knife or fry something in a thin, warped skillet. Since moving to a small apt, I’ve had to make decisions what I really want to have around here, and think good cookware is always a great investment. One doesn’t need a lot of it, but a few good pots and pans (and scissors) makes a big difference. Amy: Whenever mine disappear, I know to head straight to the desk, since “someone” obviously used them without returning them to their proper place. Which around here, is a cause for capital punishment. Ok, you’ve inspired me to do a kitchen drawer cleanout this weekend! Also to spend the cash and get a decent pair of kitchen scissors! I religiously use my scissors too, and my husband knows which ones are the kitchen scissors and which ones are not (he knows better now than to disappear with the wrong ones). Great post! It hadn’t crossed my mind how useful scissors could be in the kitchen. I’ve used them for cutting up butcher’s twine and hacking open the occasional plastic wrapper but aside from that I’ve always turned to my trusty chef’s knife. 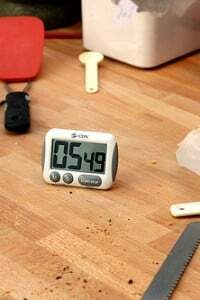 I like the simplicty of them though – I recently wrote about kitchen gadgetry and reached pretty much the same conclusion as yourself: that few kitchen gadgets are worth owning. 95% of jobs can be done with the most basic of utensils. You are awesome. Just like your scissors. When I was taught as a child how to cook by my Grandparents, scissors (GOOD ONES!) were a kitchen staple. I recall many instances where friends or family would look on in horror as I trimmed raw chicken breasts with my trusty scissors, and I’d have to launch into an explanation about how much more efficiently they trimmed the undesirable bits than my chef’s knife. I’ll be there in three weeks. This crazed Americain may just smuggle over a backup Michael Graves vegetable brush and hide it somewhere in the city for you. I have those same scissors and LOVE THEM! Let me know if you need me to pop in to Tarjay and get you another veggie scrubber…. ;-) Target stores are on every corner here in Michigan! thanks for this post. 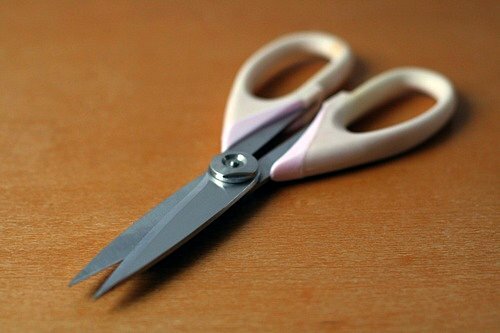 I have been starting to use scissors for everything in the kitchen after getting a great pair at Christmas. I felt sort of sheepish about it, but now I feel free to snip away! Dear David, we’re returning to our sometime place in the 11th in late July. We live most of the time in Minneapolis, home of Target – so if you’d like a delivery of anything, happy to oblige. If you care to, you can mail me through the website link behind my name. I want to add that its worthwhile to get a pair of scissors that comes apart (into two pieces) for cleaning – then you never have to worry if you’re cutting raw chicken with them. Thanks for the helpful post. 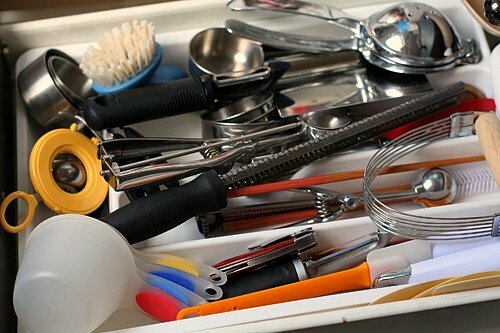 I will be spending the summer in Paris for a pastry internship and was wondering what utensils I should bring with me for use in my boyfriend’s tiny apartment kitchen. I planned on bringing my microplane and some good spatulas, measuring cups, ect… but had overlooked scissors. I’ll be tucking those into my suitcase too. I’m guilty of taking sissors forgranted. I keep both my kitchen shears and regular paper sissors in my junk drawer in the kitchen. I tend to go on a nearly maniacal rampage when I need them and they are missing. It’s not pretty, and really, I should be looking in the mirror during said rampage, because I’m the one that treated them as if they weren’t important enough to be considered cookware. Shame on me! Thanks for the reminder..I’ll at least place the shears in the utensil drawer. Right now! In Spain fishmongers use only scissors to gut and clean fishes, keeping the knife only for the occasional cut. My japanese wife was actually shocked to see my mother cut meat with scissors!! I guess it is also a cultural influence that bring us to use one tool or the other. Oh David, while reading your book the other day I was thinking of the IKEA story. It’s one of the most amusing pieces you have written (in my humble opinion). After two years it’s still just as fresh and I still get a good chuckle when I read it. When I was growing up my Mom always used scissors to cut pizza. Of course it was the Chef Boyardee pizza from the box, so a pizza cutter was worthless trying to get that soggy dough to seperate. I have always been jealous of her ability to keep those scissors in the crock in the kitchen. We all knew it was hands off those scissors!! Nobody takes my threats seriously and I always find my kitchen scissors have sneaked their way to other parts of the house. Your text made me remember when an year ago a friend suggested me to use a scissor to cut a pizza. This reminds me that I need a really good pair of kitchen scissors. Marina: You can get them at professional-supply shops like MORA in Les Halles, or perhaps even at Metro stores (if you know someone with a card.) I got mine 7 years ago. As you perhaps know, they’re more expensive here than in the states because they’re imported, re-wired, and have EU mandated safety features. I’m often asked if US-models will work here with a transformer and I know some people who do that, although I would consult KitchenAid France and inquire. They would also be able to tell you where the 5-quart models are available. There was a true celebration in my kitchen when my absolutely favorite utensil, a (Pampered Chef) kitchen scissors was found this spring under last year’s oregano patch in the garden. A couple of runs through the dishwasher and it was incredibly as good as new. Having survived months of rain, snow & sub-zero temps, it has taken back its’ rightful position in the knife block. Hubby can have the Henckels, just don’t mess with my shears! in an emergency, i’m sure one of us loyal followers would send you something from target. I love my little spatulas (like your ones) but the eggs on the end drove me nuts. As per your explanation in a comment above… I just smashed the eggs off the end with a wooden rolling pin. Very satisfying. Many thanks! I’m with you on the scissor-love. My mother has long been an enthusiast, yet for years I resisted using them much. Why do daughters do that? As for the unhappy egg spatulas, I have the same pair (also from my mother). They are excellent for prying stuck muffins out of muffin tins, among so many other uses. And I have to say that the stupid egg face has grown on me. Wierd, I know. I have been wanting scissors for awhile, amongst many other kitchen gadgets, but I do get very good use of my mini spatulas, too! They are perfect when coloring small amounts of color for cake icing, that’s when they get the most use. 1) my plastic heat safe spatula, one for savory food and a small and large one for baking. 2) cheap, unfancy tongs that open with one swift motion to the hip and open and close easily without straining my hand. 3) Victorinox 4 inch serrated pairing knife. Everyone should have this. Everyone should get 20 of them and give it to all their family and friends. At 4 bucks this knife is a steal. It slices through steaks and whole chickens like butter, great for cutting tomatoes and supreme-ing citrus fruit, and is perfect for cutting cakes, especially chiffon cakes that get squished with straight edged knives. Really this knife cuts everything in a cinch from heavy duty to intricate detailed work. The serrated edge is amazing! I have two pairs of kitchen scissors and they are invaluable. As a mother of small children they come in handy to cut their food into maneagable bites every night. Pizza is an obvious application but scissors are the only way to cut spaghetti, sushi, crepes, sausages. I am considering setting the table with a fork, spoon and pair of scissors for each member of my family. That would be fun to watch! I am another American living in Paris and I was just in the US for the first time in a year and did not get to go to a Target!! It was the only place I really wanted to go, but somehow or other, it did not happen and I had to settle for a CVS. Ugh!!!! I literally had dreams about shopping in Target several times per week. I went to a giant Carrefour last week (the closest thing to a Target in France) and they did not have dental floss!!! Not one package!! You are speaking somewhere tomorrow at 12:15 and I am excited to report that I will be in attendance!!! I won’t say where it is because all the other readers will try to show up and it is an invitation only event. I am going to try really hard not to attack you or bombard you with questions because I know you would hate that….but no promises. lol. Totally kidding. What’s the round yellow thing? You have someone who steals your veggie brush to wash pots too? Yikes! Good tip about using a scissors. I should take that advice more often, as I spend an inordinate amount of time cleaning cutting boards! I have always read you blog and it’s my first time commenting! I could relate to the scissors so much! We Koreans cut everything with scissors, Korean bbq for one, pizza, bread, noodles, and anything you can imagine. At first I thought it was just wrong but I find myself doing the same! Oh, you just had to bring up scissors! If I could only post a glimpse of the 85-year-old man laying with his derriere facing the front door of the gym, legs in the air, wearing nothing but dolphin shorts, doing scissor kicks right as we walked in last night for our workout, you would know just how cruel this post is. HAHAHAHAHA!!!!!!! Lunch, anyone? That said, I agree wholeheartedly! Scissors are essential, and I use them all the time, as well. Nice tutorial, David. I have two sets in my kitchen. I use them so much, I stand them in the block with my knives. I really get turned on by clipping gadgets and scissors, and even if I am being frugal I will usually give in and buy something from that aisle, even if it is just a new mini microplane for nutmeg and such to keep on the spice shelf. Your guinea hens look gorgeous! 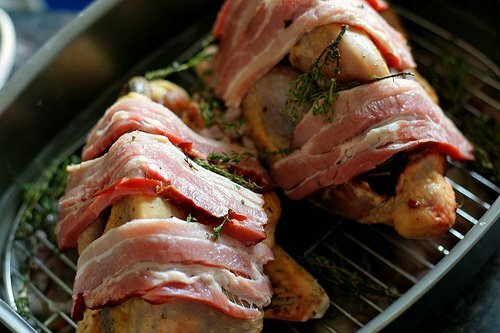 I do a bacon wrapped turkey few times a year, and sometimes put cider in the brine, but your guinea hens with cider… wow! I love it!!! Just the chocolate thermometer? Do you have a candy thermometer as well? And another for meat? It seems silly to me to have so many– I’m half tempted just to get a digital probe thermometer to use for making pot roast, candy, and tempering chocolate (but not all at once! ), even though I know it’s not right. David, I too use scissors more and more. Never cut chives, or any herb for that matter, with a knife any more. I fold the chives several times and snip, snip for perfect cuts. I agree about the Kitchen Aid, best kitchen scissors I’ve owned. Speaking of cherry pitters, we used the “pair” I have in my kitchen drawer yesterday. And when my two girlfriends commented on them, and asked why I had two, I just looked at them and smiled. It was at that exact time that they were both doing the pitting and I was stirring the ice cream custard! I’m not a gadget person. I believe in having the right tool for the right job, and I have what I need for the task at hand. Gadgets are for marketing and moneymaking, not for a real cook. I, too, have the KitchenAid scissors. Love them! Pita, chives (all manner of herbs, actually, but tonight it was chives), salad greens, twine — and the price was certainly right. If you’re cutting poultry, though, the Wüsthof take-apart shears are fantastic. I’m vegetarian, so it’s not a huge issue, but my mom got the shears/paring knife set for her birthday and it’s especially nice to clean the nooks and crannies if you’ve used them on meat/poultry items. BTW, between your vanilla and crème fraîche ice creams and Claudia Fleming’s buttermilk one (via SmittenKitchen), I’m doing my part to insulate Minnesota dairy and egg producers from the recession…. I love my scissors. I replace them often….about once a year. When I get the last kiddo raised and out the door, I’m going for a good pair! I keep my sewing scissors under lock and key. I literally cried when I found my daughters cutting construction paper with them. I have a large kitchen and I, too, have a box of gadgets that I don’t use and that drive me crazy when they lie around the drawers without any purpose. the price of that mixer is amazing. I could not believe it. I agree about the kitchen scissors. I love mine just as much as I love my microplane zester. I also am a “Bonnie Scissorhands”…love my Messermeister all-purpose scissors and keep them within an arms length of my work/prep area. I’ve discovered that they shortcut the cutting of the “stem-tips” of haricots verts. I line up the tips and lop off 10-12 at a time! kupkake: One of my friends bought a double spring-loaded cherry pitter, with the intention of doing two at once. I didn’t work well, and I haven’t seen one since. So we’ll still have to rely on the kindness of strangers, and friends. Mo So: It’s for lopping the top off soft-boiled eggs. I could be construed as a gadget, but it’s so fun to use, I had to have one. stephanie: They only sell floss at pharmacies, as far as I know. For some reason, I guess they don’t want it to get into the hands of people who might abuse it! marly: I do have a sturdy Taylor candy thermometer, but I store it in a cardboard tube somewhere else so it doesn’t break. (I did buy a fancy candy thermometer at a professional-supply store here, whose silicone protection melted in a syrup I was making!) My chocolate thermometers (yes, I have a couple) come in a stiff plastic tube so they don’t break. I love my scissors, like flavia, I use them for herbs. Today I snipped up some dill for potato salad. So much neater and quicker than chopping. Lately and with particular ingredients, I’ve been getting even more minimalist. My morning scramble, with mushrooms and asparagus, no longer requires any utensil except a fork for whisking the eggs and silicone spatula for stirring them around the pan. The ‘shrooms and asparagus I simply tear or snap by hand. I use mine for cutting up carcasses too. I’m not so good with a butcher’s knife. I was rather intrigued to see what gadgets you had in your kitchen drawer and am so glad to find that someone else also thinks it is reasonable to have ice-cream scoops in all different sizes! I, too, am a big fan of scissors in the kitchen and am still using a trusty pair which my mother gave to me when I first moved out of home (14 years ago!). I also have a special pair of poultry shears since I am not safe around a meat cleaver (which I also have, but since I am so afraid of using it, it is merely there to complete my knife collection). i have the same kitchenaid scissors, a gift from my parents, and they are perfect! turns out i’m particular about the design of my kitchen scissors (who knew?) and these fit the bill. i packed them with nearly an entire suitcase of home and kitchenwares on my last trip home to the U.S. (i too live in paris now). but might i add a thrifty suggestion for those still lucky enough to have access in the U.S.: stores like T.J.Maxx, Marshall’s, and Homegoods are great places to look for decent kitchen tools at half the price. Me too. Sort of. Mine come apart and wash in two strange fat knifelike pieces. The main ones, that is. Cuz I have more. I do occasionally piece a bird with them, but I carve or butcher more often than I chunk. They do a great job trimming raw meat, yes. Herbs snip nicer. Scallions become thin little disks. Raw pasta rolled into a tube cuts evenly into manageable pieces for rolling or forming. Same for any stiff dough. Etc. Last night I cut off an edible portion of dry glass noodles from that enormous bunch one buys. Who needs so many? While I demand quality, weight is not necessarily part of that, because I have to carry my tools around so much and because using heavy things gets tiresome, too. You seem to have the same great vegetable peeler I do. When I was recently in the US I bought two more. Why is it that Europeans so often cannot buy European made tools? All the peelers in my city are made in China. You’ve made my day in your ode to Scissors. Next time someone (namely my husband) laughs at my frequent kitchen usage of scissors, I’m quoting you. Okay I’ll admit I’m a bit obbsessive as I do cut my toast and pizza with them… but hey it’s so simple!! I use my scissors all the time too. I love them for snipping bacon. I also use them to cut sausages into bitesize pieces, just snip them right into the skillet. It saves from getting smooshed sausage meat all over the cutting board. For what it’s worth — I’m one of those who brought my KitchenAid mixer with me. Hubby gave it to me as a Christmas present, and my friends were horrified — he gave you a MIXER?! Did you kill him? Hell no — I was over the moon, because it’s the mac-daddy badass 5-quart, 500-watt model. Way better than any I would have bought myself! I did manage to kill my ancient Black & Decker (I bought it when I was in college– cheap overruled quality at that time, and I don’t use it much) hand mixer over here — but I’m not sure if it was because the transformer was plugged into a power strip, or it was just old and gave up the ghost. Found a cheap one at Auchan that’s far more powerful for less than I’d pay to replace the B&D one. You’re so right about the scissors! I was upset when my daughter borrowed it for an afternoon! Mine’s a Zwilling Twin. I have the Wusthof scissors whose blades come apart very easily for thorough cleaning, very important if you use the scissors on raw poultry. They are one of the most used utensils in my kitchen. Sunny: I did have a US appliance that I plugged in to my transformer, and it started smoking, so I hesitate to tell people yay or nay. 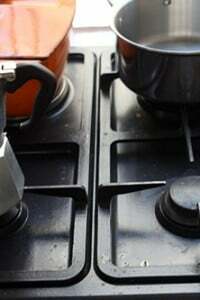 I know appliance manufacturer’s don’t recommend it and as you mention, it voids the warranty in many cases. Abigail: I know, those places are amazing. I’ve seen All-Clad pans, Katana knives, and Staub casseroles, plus other great things in them. Although if you go to a cookware shop, often they have a better selection, you can get advice, and try ’em out. Thanks for the advice, David. This is really helpful, actually! For sure I’m going to invest in some good-quality scissors. And thanks for the humor in your post. You are so funny! You know what I have in my “tool drawer” that I thought would be awesome and really just is not all that helpful? An OXO mango pitter. But actually the OXO cherry pitter is fantastic! I have 5 pairs of scissors, and they are great for chopping herbs in a cup, also my favorite are red “Joyce Chen”! Love your Terrific Ideas!! David! Gadgets aside, though I also have my own collection and not even a kitchen to put them in. (It’s a long sad story that leaves me living with my parents after college. I’d rather be in Paris.) I just had to let you know the kick I got out of The Sweet LIfe in Paris. I actually laughed out loud at several points. Usually I just chuckle within while reading something funny. I also look forward to making your recipes. I did make the dulce de leche brownies a bit ago and had to eat nearly the whole batch myself, poor me, after all my friends took a nibble and proclaimed “oh they’re so rich I don’t think I could eat much more.” Weaklings. My question is, how much french did you actually know before you moved to Paris? I’ve been, would love to live there one day, but I’m horrible when it comes to learning new languages. Do I stand a chance? Loved, loved your book. David, I am a convert to using scissors in stead of a knife too. My favorite “conversion” is cutting green onions with scissors. My favorite pair are from OXO. We have two of each-why? Just in case we go camping or my family needs extra kitchen scissors. David! I could not agree more, I just threw a hissy fit in my kitchen last week when I dove into the abyss that is my gadget drawer. My roommate thought something bad was happening from all the clatter, and rushed in to see what was going on….I was just sick and tired of digging! So I cleaned it out (well, sort of). I wanted to tell you that I nominated you for the bloggers Lemonade Stand Award this morning! YAY! You’re so great, how could I not! Hop over to the blog when you have time and see what it’s all about if you don’t already know! thanks for all the fab stories and recipes! Great post and set of comments as usual. Amen to Sarah(Coffee Beans…) for mentioning the importance of take-apartable and WASHABLE kitchen scissors! Stephanie, you usually have to go to a pharmacie to get dental floss, and even then you sometimes have to ask for it (fil dentaire) as it is often tucked away out of sight. I guess we all had Moms who had rules about what scissors are for what purpose, and we love them for it, right? 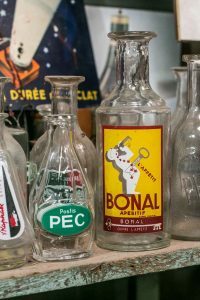 Jan: Except you do need to be careful, as fil dentaire is also French slang for a thong…which are also tucked away out of sight, for the most part! We went thru our kitchen gadget drawer and kept the most important things recently. Scissors WERE kept, as well as my garlic press, citrus press, good knives, and my Microplane zesters (my favs). Problem is keeping from using the kitchen shears for other things. I may hide them! DishinandDidhes: Get rid of the garlic press and use your Microplane zester. It does a better job and it easier to clean. And to those of you who chop garlic on a cutting board, Microplaning it doesn’t make your cutting board smell. Hi David, thanks for the response! Regarding the Taylor Candy thermometer… I have the same exact Taylor thermometer and it has an air bubble in it! I had only used it a few times before I noticed gaps in the mercury (er.. fake mercury). I’m in pastry school and the students are all issued the same thermometer– most of my classmates have had to buy new ones because of gaps too. oy! Maybe it was just a bad batch. I know Taylor usually makes pretty decent stuff. Or were we too rough with them? Maybe clanging around in our tool boxes/knife rolls made them hiccup a bit. We use our kitchen shears to cut pizza. Works like a charm. I am so glad I’m not the only one who has multiple ice cream scoops in different sizes (I think I have five, maybe six). I can’t live without kitchen scissors, though. I have two pairs of food scissors and two pairs of flower shears (they have a single blade instead of two) and woe to the person who grabs the wrong pair for the wrong job. Many years ago I watched a girl “chop” parsley in a coffee mug with scissors. At that time I called her a “hausfrau”, but secret to be told, I am doing the same now…. Love your posts. In fact you inspired me to start my own food blog. Yes, kitchen scissors are great for everything from cutting parchment paper to cutting fowl. Your mention of your chocolate thermometer prompts me to mention the laser probe thermometer which is accurate and so easy to use. I love mine, especially for chocolate. No mess, nothing to clean since it doesn’t touch the chocolate. Wouldn’t mind at all if you checked out my blog especially after I learn how to use hyperlinks hopefully in a day or two. un(e), I have been know to just cut the ingredients into the skillet. It’s funny, as you were writing about all the things to use the kitchen scissors for, I was thinking to myself how I also like to use them for cutting the backbone out of a chicken. Much easier than a knife. And then you wrote about cutting the backbone out of a chicken with scissors. I still prefer the wheel for the pizza, because I need to feel the crispness of the bottom crust as I roll across it. Scissors just don’t have that same sensory feel. And if the bottom crust isn’t crispy, then it’s not worth eating. I have a 25 year old pair of well used and loved kitchen scissors. My Dad (a retired butcher) laughs at me every time he sees me use them, I just tell him that he doesn’t know what he’s missing out on and it’s too bad he’s too stubborn to give them a try. I gave my Mom a pair to use when she can’t get the butcher to exercise his superior knife skills. Regarding the Microplane zester for grating garlic. Shazam!! Why haven’t I ever thought of that!? I’m sure I’ll never dice it with a knife again! marly: I’ve not had that happen, but some say to store candy thermometers right-side-up. I store mine in a tube, on it’s side, and it’s been fine. Phyllis: The problem with the laser thermometer, which are fun to use (! ), is that they only measure surface temperature. And the surface of something is usually going to be cooler than the melted chocolate down below. H. Peter: I’ve seen that, but haven’t done it…..yet. mairu: I have scoops in all sizes for ice cream, as well as cookie doughs. I was shocked I couldn’t find them in multiple sizes in Paris a few years back, when I was looking for ’em, until someone said “We don’t make drop cookies in France”, and then it made sense. So when I was back in the US, I hauled back all my scoops in various sizes. OK. I get it. I need the scissors. I do wonder about cleaning them – you can’t put them in the dishwasher I imagine. Are they like my can opener – destined to grunge? I have a couple of cherry pitters too, but the best tool I have used for pitting cherries is a large bobby pin–especially for sour cherries, which can get crushed by those pitters. You have to get one with a decent size loop at the end. You push the looped end of the pin through the top of the cherry, swipe the loop under the pit, and pull up. Unlike the pitter, you are left with an intact cherry, not one that looks like it has been shot with a gun. I do use the pitters for larger bing cherries though. P.S. I love kitchen scissors too. My only pet peeve about them is that some people treat them like a tool at the writing desk, and don’t wash them after use! @Kim — my shears go in the dishwasher all the time — I put them into the silverware basket, in a compartment by themselves (so nothing can tear up the blades) and open them just a bit. The points settle into the grid at the bottom of the basket, and they get clean all the way back to the pivot point. I know there is some in *auchan*, and probably at *casino* too. I’ve found some once or twice at *champion*, (now called simply market). but you’re right, the fact is dental floss is not taught here to children and grown-ups : some of my friends did not know what it was for and how to use it properly, and those who knew had memories about american movies :D.
I know what you mean about the Michael Graves vegetable brush… I am on my third one so far. “Someone” has decided to use them to brush all sorts of things, not just pots and pans. Fortunately, my nearest Target is just a 10 minute drive away. I must definitely find a new hiding place for my vegetable brush. David, there’s no such thing as a disproportionate amount of counter space for a Kitchen Aid stand mixer! Six months ago, I packed up all but a few utensils in an attempt to clear the kitchen of clutter and thus make it attractive to home buyers. The house is still for sale but I haven’t missed a single gadget. Surprising what you can do without. You will definitely not catch me scoffing at mini spatulas. I love mine. And my kitchen scissors are stuck to a knife strip at all times (except when my six-year old steals them for a science project). I have scissors in every room, but I can’t imagine not having them in the kitchen. They save me so much time, especially since I just snip open packages and don’t need to gnaw into them with my teeth…. David – I actually use the ice cream scoops more for portioning cookie dough and cupcake batter than scooping ice cream. How else are you going to get the same ratio of cream-cheese filling to chocolate cupcake in your Black-Bottom cupcakes? Sue, I use the Microplane for grating garlic and ginger all the time. It’s perfect. When I was in middle/high school/college and ate microwave pizza all the time (you know – the kind that goes on a silver-colored cardboard box so the crust gets all crispy) I would use scissors to cut it into six or eight perfect pieces. I also like “chopping” herbs with scissors when I don’t want to bother with having to wash another knife/cutting board. My dishwasher has a kind of long, narrow portion of the cutlery basket which I use just for scissors, spread open, points down. Works perfectly. I love my Fiskars kitchen scissors and use them all the time. They’re very study yet light. Sometimes I use them to cut up herbs. They are collapsible, so they take up a lot less space in the drawer! I should add, the bobby pin trick really only works with sour cherries, but for them it works very well. Plus, you now have as many cherry pitters as are in a package of large bobby pins. I am late to the game here, but I just wanted to concur…I bought kitchen scissors a few years ago, actually thinking how silly I was, and now, I couldn’t live without them! I’d almost rather give up my knives. If it was a Sophie’s Choice kind of situation.